Below we show some measurements of the current energy consumption I did after attaching a new low friction belt recently provided for a Life Fitness T9i treadmill at the gym. For this test, I measured the current "before" and "after" by using an RMS (AC) amperometer on the treadmill. The results below are what I got at 7km/h steady (normal pace). For greater clarity, the terms "unloaded" and "loaded" below simply mean if there was someone or not on the treadmill when the measurement was taken. Finally, for true engineers out there, the user's weight is 91kgs (200 lbs) and the treadmills are all European, spec. 220V AC 50Hz. The original belt and deck were in good condition and well lubricated, the belt did not really require replacement but we wanted to do a test. The base current measured here in the "first" state was quite favorable (low) and would not justify itself replacing belt and deck. This reflects the high standard in which we keep the gym equipment entrusted to our assistance. By comparison, in my experience, I measured the current absorption up to 6A or 8A loaded in structures where there was little or no maintenance of treadmills. In these situations, a low-friction belt and a preventive maintenance routine could reduce energy consumption by 75%, a reduction that will allow considerable bill savings on the exercise cost of the treadmill. 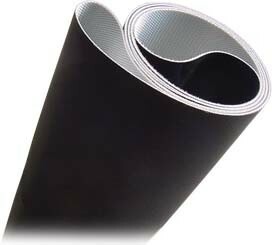 I can conclude that, in any case, using a new low friction treadmill belt, even if the original belt is still in good condition, provides a significant and measurable reduction in current absorption. Even under these rather favorable conditions, I was able to measure - 0.6A (-23%) current after the new deck and belt had been mounted. The obvious saving in management costs, in my opinion, easily justifies the replacement of the belt. Not only does it reduce electricity consumption but it will also have a long-term positive effect on avoiding the replacement of expensive components such as the board and (on domestic models) the engine; the lower power consumption means that these elements will work better and for a long time to maintain high performance while remaining with a suitable load for their design parameters (so without stresses that would lead to premature failure! ).